This page is currently being rewritten as part of the Skyrim Quest Redesign Project. This article is about the vampire version of this quest. For the Dawnguard version, see Prophet (Dawnguard). The time of prophecy has arrived! Locate a Moth Priest for the vampires. Report back to Lord Harkon. Seek out Lord Harkon as directed by Garan Merethi at the end of the previous quest. 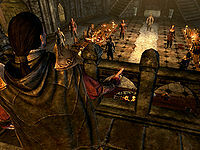 The leader of the Volkihar is in his chambers, located east of the entrance to the Cathedral. Question him about wanting to speak with you, and he will let you in on his plan to end the sun's tyranny: "Yes, I did. When I told you that I was grateful for my daughter's safe return, I told the truth. But I did not tell you everything." There are two options, both of which end up at the same place. If you tell him you suspected as much, and he will respond: "Good. Strong instincts and a cunning mind will serve you as well as blade, spell or claw." If you instead ask when he plans to start trusting you, you'll be told: "Do not presume to tell me who I can and cannot trust. I possess the wisdom of a dozen lifetimes, and I will make my own judgements. Now be silent, and hear what I have to say." "Scions of the night! Hear my words! The prophesied time is at last upon us. Soon we will claim dominion over the sun itself, and forge a new realm of eternal darkness. Now that I have reclaimed one of my Elder Scrolls, we must find a Moth Priest to read it. I have spread false rumors about the discovery of an Elder Scroll in Skyrim to lure a Moth Priest here. Now it is time to see if those efforts have borne fruit. Go forth, and search the land for rumors of a Moth Priest within our borders. Look to the cities. Speak to innkeepers, carriage drivers, anyone who would meet a traveler. Go now, and carry out this task. This is my command!" As Harkon said, there are two potential sources to check out: innkeepers and carriage drivers. Serana will approach you after the speech and give you another lead: the College of Winterhold. According to her, wizards always know about things people shouldn't know about. She will also request to accompany you on the trip, as she is feeling restless after being trapped underground for so long. When you do as Harkon and Serana suggested and talk to the people of Skyrim, you have a few options. Carriage drivers are the easiest: all of them know immediately what you are talking about, and they are positioned outside all the major cities. You'll have to pass a Speech check to get the information for free; otherwise it will cost you. Innkeepers are another choice; however, only Corpulus Vinius at the Winking Skeever in Solitude has a clue, and he requires a Speech check or a bribe as well. It takes a bit of travel, but Urag gro-Shub, the librarian at the College of Winterhold will tell you there is a Moth Priest in Skyrim for free: "The obvious answer is to go to the Imperial City. The Moth Priests make their home in the White Gold Tower. Sometimes they go out looking for Elder Scrolls. Lucky for you, there's a Moth Priest in Skyrim right now, doing just that. He stopped in to do some research in the library, then left for Dragon Bridge. If you hurry, you might catch him there." He will always tell you this regardless of your standing at the College, though College quests like Containment and The Staff of Magnus can block this dialogue. Once you have arrived in Dragon Bridge, ask the guards or townspeople about the Moth Priest. The adults in town will tell you they don't know anything and direct you to a guard. Some guards may not have the dialogue option, or only respond "A Moth Priest?" and not say any more, while others will realize what you're talking about and tell you what you want to know. The most reliable method is to find the only child in town, Clinton Lylvieve. He will be excited to share the information with you: "I don't know what a Moth Priest is, but I did see an old man in a robe not long ago. He was riding in a wagon with some Imperial guards. They didn't stop to visit, though. They rode through town heading south, and went across the big bridge. It was only just a little bit ago. I bet you can catch them if you hurry up." Head across the Dragon Bridge and make your way south along the road until you come across a wrecked carriage. Among the wreckage are a dead horse, a bloodstained corpse, a copy of the book Effects of the Elder Scrolls, and a dead vampire. Search the vampire to find a note directing you to Forebears' Holdout, a ruin up the hill to the northeast. Follow the blood spatters, and when you reach the four standing stones, the entrance is to the north. Inside, you will see what appears to be a ruined underground fort inside a large natural cavern divided by a river. Past the fort, you may notice the large blue-green orb on the platform; this is your target. Dawnguard Lieutenant: "Those vampires put up a hell of a fight." Vanik: "I just hope we weren't too late. I'm not sure what they did to this Moth Priest, but he doesn't look right." Dawnguard Lieutenant: "You think they turned him?" Vanik: "I don't know, maybe. Won't know until we get him out of there." Dawnguard Lieutenant: "How do we do that?" Vanik: "I'm working on it, now give me some silence so I can think." Kill them, and search the corpse of Malkus, located between the barrier and the west wall, for the weystone focus. With this in hand, go up the western stairs and find the weystone source on another platform overlooking the barrier. Activating the source with the focus in your possession will drop the barrier, and Dexion will emerge, chanting, "I serve my master's will." His demeanor will then change: "But my master is dead, and his enemies will pay!" He attacks you with all his might, so fight back until he yields. While he is kneeling, use your Vampire's Seduction power on him. Activate him after this to feed on him and make him your thrall. He will be awestruck: "By the divines! It's as if my eyes have been opened! I am blinded by the light of your majesty. I... I must obey you. What would you have of me, master?" Order him to travel to Castle Volkihar, where you must return as well. When you arrive, your new thrall will be waiting in the main hall, along with your fellow vampires. Talk to Harkon at the far end of the hall. When you tell him what you have done, he will say, "Yes, I see that. I trust his capture was not too difficult a task?" You then have three options; whichever one you choose, he will then give you your next instruction: "Well, your thrall awaits and we have given him the Elder Scroll. Command him to read it, and let us hear the words of prophecy together." "I see a vision before me, an image of a great bow. I know this weapon! It is Auriel's Bow! Now a voice whispers, saying "Among the night's children, a dread lord will rise." In an age of strife, when dragons return to the realm of men, darkness will mingle with light and the night and day will be as one. The voice fades and the words begin to shimmer and distort. But wait, there is more here. The secret of the bow's power is written elsewhere. I think there is more to the prophecy, recorded in other scrolls. Yes, I see them now... One contains the ancient secrets of the dragons, and the other speaks of the potency of ancient blood. My vision darkens, and I see no more. To know the complete prophecy, we must have the other two scrolls." Thus ends Prophet, and begins the next two quests, Chasing Echoes and Seeking Disclosure. If you do not possess the power Vampire's Seduction when you are required to enthrall Dexion Evicus, it will be granted to you temporarily in order to perform this task, then disappear. If you have been cured of vampirism, you will need to ask Serana to make you a vampire again, then wait for 24 hours to regain the power. If your current stage of vampirism normally allows you to use Vampire's Seduction, it will be unavailable at some point[verification needed — see talk page] during the quest until you need it to enthrall Dexion. Be careful with your aim when using Vampire's Seduction, as it can only be used once each day. If you miss, you'll have to wait a full 24 hours to try again. Dexion will remain patiently cowering on the ground where you defeated him, however. Clinton Lylvieve sometimes wanders outside the borders of the town, in which case, the dialogue option for the Moth Priest will not be available. Wait for him to get closer to town and it will become available again. After you are told to go to Dragon Bridge, you can instead head straight to Forebears' Holdout, where at a point inside, the quest will update and proceed normally. Talking to the guards in Dragon Bridge may not bring up a dialogue option to ask them about the Moth Priest, even when you have been directed towards them by other citizens. This bug is fixed by version 1.2.5 of the Unofficial Skyrim Patch. If you exit the castle before Harkon finishes his speech, Serana might not come up and talk to you, preventing quest progression. ? It is possible for Dexion to escape the barrier prematurely and become permanently hostile to you. This bug is fixed by version 2.0.1 of the Unofficial Dawnguard Patch. Once you defeat the enthralled Moth Priest and use your seduction power on him, the option to feed may not appear. Instead, he simply stands there and says "I am not afraid of you" and "Your kind are a blight on Tamriel, monster." Use the console command setstage DLC1VQ03Vampire 70 to progress. When the Moth Priest reads the scroll, the quest may not progress. Use the console command setstage DLC1VQ03Vampire 120 to advance to the next stage. Hitting the Moth Priest with anything should also fix this. 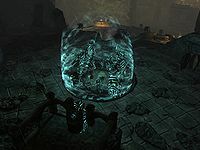 Upon returning to Castle Volkihar with Dexion Evicus, he may become hostile towards the castle's inhabitants and attack them, preventing the quest from progressing. ? Open the console, select Dexion, and enter the code setav aggression 0 to remove his hostility. You may have to reload a previous save before entering the code if Dexion has already engaged in combat with the vampires. After using Vampire's Seduction to feed on the Moth Priest, he may remain hostile. This will prevent you from commanding him to go to Volkihar Castle. Leaving the cave and reentering should remove his hostility. This quest may not activate after completion of the previous quest. 5 When I returned to Castle Volkihar, I was informed that Lord Harkon was waiting to speak to me. 10 When I returned to Castle Volkihar, Lord Harkon told me of a prophecy hidden in the Elder Scrolls that, if fulfilled, would end the tyranny of the sun over vampires. Now he has asked me to join him as he makes a proclamation to the court. 20 Eager to unlock the secrets of an ancient prophecy thought to be hidden within Serana's Elder Scroll, Harkon has ordered his court to find a Moth Priest. 30 Eager to unlock the secrets of an ancient prophecy thought to be hidden within Serana's Elder Scroll, Harkon has ordered his court to find a Moth Priest. 40 Eager to unlock the secrets of an ancient prophecy thought to be hidden within Serana's Elder Scroll, Harkon has ordered his court to find a Moth Priest. I now have reason to suspect that there's a Moth Priest in Solitude. 45 I learned that a Moth Priest recently visited Solitude. He was thought to have stayed at the Winking Skeever. 47 Harkon has ordered his court to find a Moth Priest who can read Serana's Elder Scroll. I now have reason to believe that a Moth Priest has recently visited Dragon Bridge. 50 Harkon has ordered his court to find a Moth Priest who can read Serana's Elder Scroll. I followed the trail to Dragon Bridge and learned that a Moth Priest had just passed through town. He was last seen heading south along the road. 55 I'm one step behind the Moth Priest. After leaving Dragon Bridge, I searched along the road for any sign of his passing. I found an overturned wagon and some dead vampires and Imperial guards. Was this the Moth Priest's wagon? 57 I'm one step behind the Moth Priest. After leaving Dragon Bridge, I searched along the road for any sign of his passing. I found an overturned wagon and some dead Imperial guards and vampires. Was this the Moth Priest's wagon? 60 Following Harkon's command to locate a Moth Priest, I followed the trail to Dragon Bridge. There, I learned that a rival band of vampires abducted the Moth Priest I've been tracking and took him to a place called Forebears' Holdout. 65 After a rival vampire faction captured the Moth Priest, I tracked them to Forebears' Holdout. Their leader has enthralled the priest and I will have to confront him in order to assert my own hold over him. 66 After a rival vampire faction captured the Moth Priest, I tracked them to Forebears' Holdout. Their leader has enthralled the priest and I will have to confront him in order to assert my own hold over him. 67 After a rival vampire faction captured and enthralled the Moth Priest, I fought him and forced him to submit. Now it is my turn to enthrall the Moth Priest by using my newfound powers. 70 Eager to hear the contents of Serana's Elder Scroll, Harkon commanded the court to find a Moth Priest. I have now captured one and made him my thrall, commanding him to return to Castle Volkihar. I must report this success to Harkon. 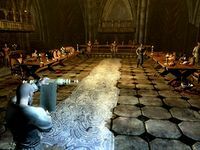 100 With the Moth Priest safely back at Castle Volkihar, the time has come to hear the prophecies contained within the Elder Scroll. 130 After the Moth Priest's reading, we have more questions than answers. The old priest saw a vision of a weapon called Auriel's Bow, but we need to read two more Elder Scrolls in order to unravel the rest of the prophecy. 200 Finishes quest After the Moth Priest's reading, we have more questions than answers. The old priest saw a vision of a weapon called Auriel's Bow, but we need to find two more Elder Scrolls in order to unravel the rest of the prophecy. The following empty quest stages were omitted from the table: 0, 61, 68, 90, 110. On the PC, it is possible to use the console to advance through the quest by entering setstage DLC1VQ03Vampire stage, where stage is the number of the stage you wish to complete. It is not possible to un-complete (i.e. go back) quest stages, but it is possible to clear all stages of the quest using resetquest DLC1VQ03Vampire. This page was last modified on 9 October 2018, at 19:59.